Medway’s 1-3-1 zone caused Medfield all sorts of problems early on. 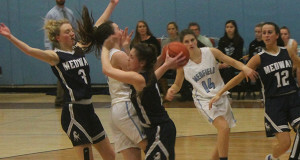 A hard foul as Medfield takes a hand to the face. 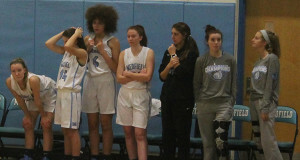 For essentially three quarters, the Medfield girls’ basketball team was getting killed by Medway. Then, a riveting fourth quarter comeback had the stands going wild, Medway in chaos, and sportswriters looking for dramatic metaphors. But Medway’s Julia Dowling was not going to let her team lose. Up just three points with a minute and seventeen seconds left, Dowling hit a huge three that essentially ended the game. In the end, Medway would win the game, 46-39, and for coach Joe Iannone, there was no question who came up big. As well as Dowling played, the game never looked like it was going to be close. After the first quarter, a flummoxed Medfield trailed, 13-2. At the half, they were still down, 23-9. Medway was running the rarely-seen 1-3-1 defense, which is partly designed to confuse offenses that don’t see it every game. But Medway, in some ways, shot themselves in the foot. With a big lead, Medway still played fast (due in large part to Medfield’s adoption of a full court press) rather than holding the ball and killing as much time as they could. Coach Iannone acknowledged this, saying that he told his girls to stay aggressive, but they lost their composure in doing so. Despite the Warriors having harangued and outplayed the Mustangs in the second half, beating them by a 30-23 margin, it was the visiting team that held on for the win. 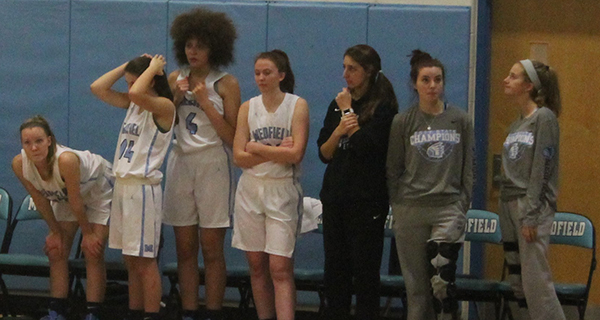 The tense game took its toll on the Medfield bench. With the win, Medway moved to 4-2 with a four-game win streak, while Medfield’s moral victory brought them to 3-3.